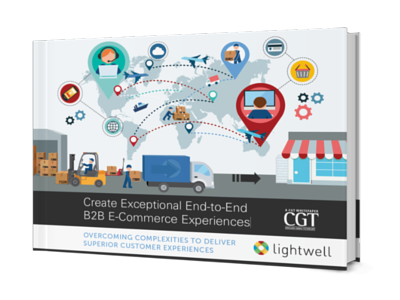 Delivering great B2B e-commerce experiences can be extremely challenging...but very rewarding. Learn about the essential capabilities and processes for ensuring your company's success. Today's top B2C e-commerce sites can deliver personalized, seamless, and trustworthy experiences. They also raise expectations that—despite the added complexity—business-to-business (B2B) e-commerce experiences should be just as good. For many B2B companies, so much must happen beneath the surface to achieve this. Among many other complexities, they must address customer-specific pricing, approval processes, delivery agreements, while supporting multiple selling channels and business models. This requires a well-orchestrated and tightly integrated array of technologies and processes. Please complete the form on this page to view this white paper today with our compliments.